Have you ever watched a high level athlete, professional dancer, martial arts champion, or person who is really good at movement? They usually you have fluid, strong, balanced, and rhythmical movement. They don’t look rigid, slow, or awkward with their movements. It is important for human health to move, that has been well documented. It has also been well documented that our bodies are capable of moving in three dimensions. We move up & down, side to side, twist, jump, we move in multiples angles all at the same time. If we don’t train and ready our bodies for movement in all directions then we could potentially lose the capability to move or have restrictions leading to compensations when we do our daily tasks, even something as simple as walking can be affected leading to chronic or traumatic injuries. Having restricted movement can cause devastating cumulative effects on our bodies. It will also affect the athlete on the field or court of play. If they can’t move they will not be successful in their chosen sport. The question then becomes what can we do to help our bodies move well? The answer to that questions is simple, move. Make sure to move in every direction you can. How can you do this in the gym? One example is take a simple lunge and perform it different planes of motion. You have the traditional forward lunge that everyone knows and does but you also have the backwards lunge, lateral lunge, lunge with reach, transverse lunge etc. The list goes on and on. 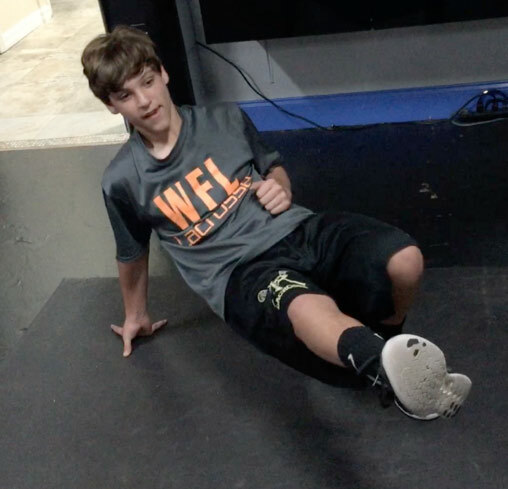 By performing exercises in different planes of motion you are preparing the young athlete for what he or she will encounter in their particular sport. The majority of sports require the athlete to move in multiple planes of motion, thus this skill must be trained so as to aid in athletic performance and injury prevention. There is another benefit to training that is movement based, it’s more exciting. In the picture above this young athlete is performing a kick through. This requires core strength, shoulder mobility/strength and multi planar movement in order to be able to thread the leg. It’s one example of many exercises that we use to teach kids how to move and develop strength, coordination and flexibility, thus setting themselves up for athletic success. The Tampa Strength Academy quick kids program will be starting Saturday April 2nd. This dynamic and more importantly fun class will teach kids the fundamentals of movement, thus teaching them skills they can use on the athletic field and in everyday life. Click here for more information about the program.